The Capoeira Multi print is coming. There is also an Energy Bra in this print. People seem to either love this or hate this. I am on the fence. I like the crops better than the pants we've seen but I'm pretty sure it will not come in a 12. Pretty Hero Blue Daily Practice Jacket. Ugh, where are the non-print CRBs? I'd love a solid Boom Juice (hopefully thicker than last year) and a Hero Blue, or heathered in both of those colors. More mesh insert bottoms. Yawn. 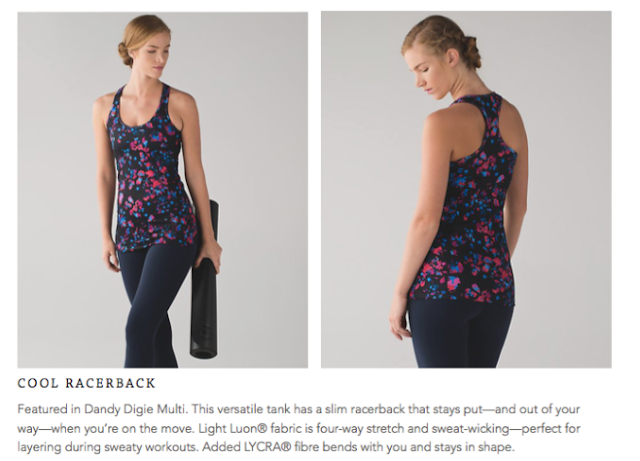 I like the new print in the bra, but I agree - not so great in the pants, it's too much. I think the bra would be cute popping out under a solid colored tank though. Wow - that mesh placement would soooo not be flattering on me. I hate the new print.... I'm also curious as to why they never made more CRB's in Rulu. I don't hate the print but I don't love it either. It's certainly different for lulu. But at this point I ask myself how often would I reach for those bottoms and I know the answer would be rarely....so I will pass. I do like it better in small doses like the bra. Capoeira Multi is awful. Looks like clown pants. Hoping for CRB in Boom Juice too. Canada isn't really getting anything interesting as of late. That hero blue is so gorgeous !!! I hope they make lots of stuff in this colour ! I am also really disappointed that there are no new solid color CRBs. The recent releases were all colors which are unflattering on me - light flare (I am not a fan of anything orange-y) and ray (I can't wear neon), or colors I have - raspberry, cool breeze=lullaby. Would love some vibrant greens, blues and definitely would like boom juice. Hero blue is lovely. I will have to purchase something in that colour. Capoeira print, not so much. It's like a clown threw up a bunch of confetti. Safe for another week if this is all Lulu's offering. Agree on the mesh inserts. If I need more ventilation I'll wear shorts, ditto ventilation in long pants I'd rather just wear crops. I wonder if the new printed CRB has a white inside or not? the ones with white on the inside don't work for me - they show white on the outside when stretched out over my bust area :( I'd love that CRB if it doesn't have a white inside. I'm also hoping for a Boom Juice CRB. Totally irrelevant, BUT anyone know of any Lorna Jane swap groups? I'm an east coaster and don't have a store near me. All I can find online is AUS stuff, apart from the Lorna Jane website. Nothing of interest, fortunately for my wallet. I really do not like the print. @ anon 4:39 pm - agree 1000%! 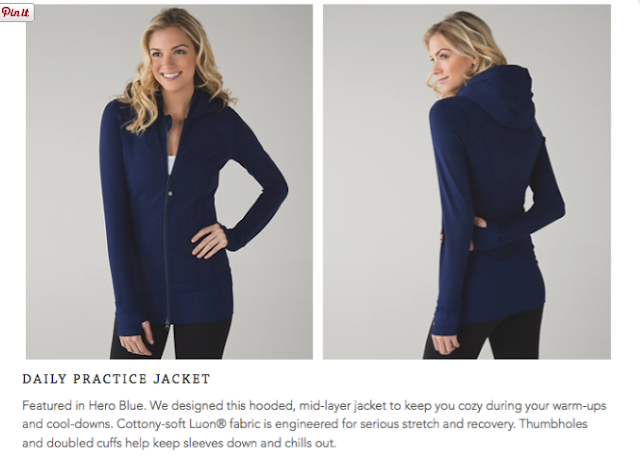 There is a down-lined raincoat coming - a waterproof shell with a 650-fil removable down liner called the Four the Helluvit Jacket for $298 - in the new Hero Blue coming. You would have thought that would have come out in November/December. February is when winter stuff gets marked down here. That shifted horizon print screams winter to me. 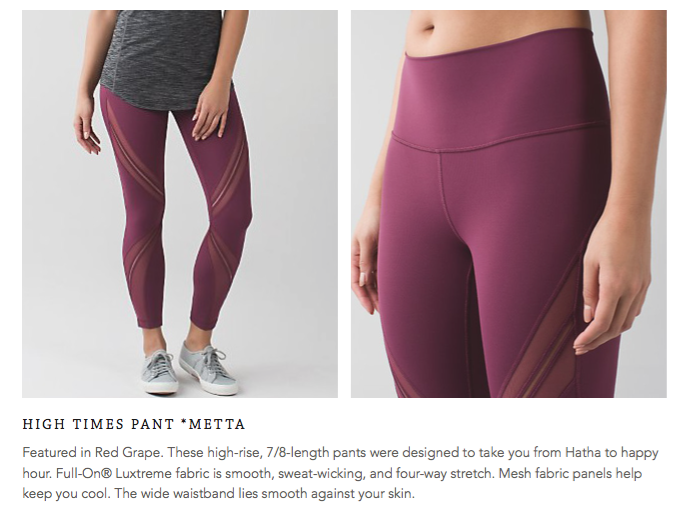 Lululemon really screwed up the timing on a lot of stuff this fall/winter. Oh boy this is al. just terrible... Kind of hideous actually. @Anon 7:21 - SO glad they're denim luon! I love the denim luon WUC. I was hoping they'd bring those back. yeah don't like prints too often like the solid crb's as well..... i have so many from years past so don't buy new ones too often, always waiting for an exciting new color and i havn't seen too many that arn't super close to colors i have so that said they def could work on coming out w/ some new exciting colors for sure. 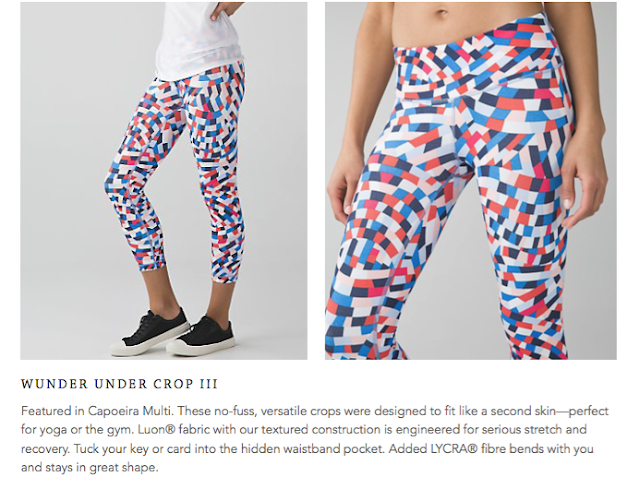 In general I do not like the Capoeira Multi print. However any print in small doses can be cute so I do think it is OK in the FTBW but I'm not sure I'd spend my money on that particular one vs. the other ones. I'd maybe buy it on markdown. It would probably look cute in a short as someone has mentioned. In the pant and crop it is just way too much and I can see why all the cracks/jokes abound. Too much is "what were you thinking?" I can't believe LLL chooses to invest their resources in "meh" stuff like this. Stuff is becoming too other brand (Nike, Athleta) etc. Are they really out of ideas to be unique? I am longing for a NICE CRB in a solid colour like Hero Blue, Alberta Lake (oh to dream), and some non-neon, non-pink, non-orange, non-heathered, non-print! I like the pattern on the capoera print, but not the color combo. I have a pair of Dharma Bums crops in a similar pattern but with yellow and red (crazy) and I really enjoy working out in them.